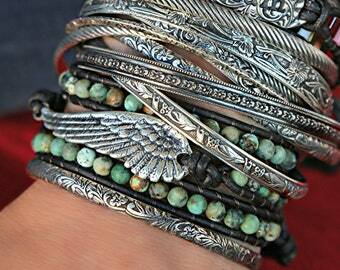 Boho Jewelry, Bohemian Leather Wrap Bracelet: Our NEW angel wing triple wrap bracelet is created from a warm deep dark brown leather cord accented with gorgeous 4mm matte African turquoise beads. The culmination of natural materials like real leather and the mottled muted shades of the lusterless stone results in an enchanting Earthy bracelet with an organic feel mixed with a modern bohemian look. Featured as the focal point is a handmade heavenly sterling silver angel wing, curved for ergonomic comfort, oxidized heavily and spot polished to highlight the detail in brilliant contrast. A little surprise on flip side for you- the word, SOAR, in stamped into a faint floral design. The end is finished with a matching sterling silver handmade floral swirl button clasp that can be fastened into 1 of 3 loops for adjustability to fit wrists ranging from 6”-7.5” (15cm – 19cm). So gorgeous and comfy it will quickly become your favorite. Wear it solo, or stack it with your other fave bangles and bracelets to keep you right on trend with a fun carefree bohemian look. Wanderlustrous! MEASUREMENTS: Wrap bracelet total length is about 24” (61cm) long. Button to first loop is about 20 ¾” (53cm), second loop, 21 ¾” (55cm), 22 1/4” (56.5cm). Wing is 1 ¾” (43mm) long x 5/8” (14mm) tall. Bracelets are handmade one at a time so measurements MAY VARY SLIGHTLY. As with many fine jewelry pieces please avoid contact with harsh chemicals like bleach, found in household cleaners, pools, and hot tubs. Natural materials, of course, are durable but not indestructible and will eventually wear out in time, so please don with care and remove before bathing or swimming to extend the longevity of your boho bracelet. 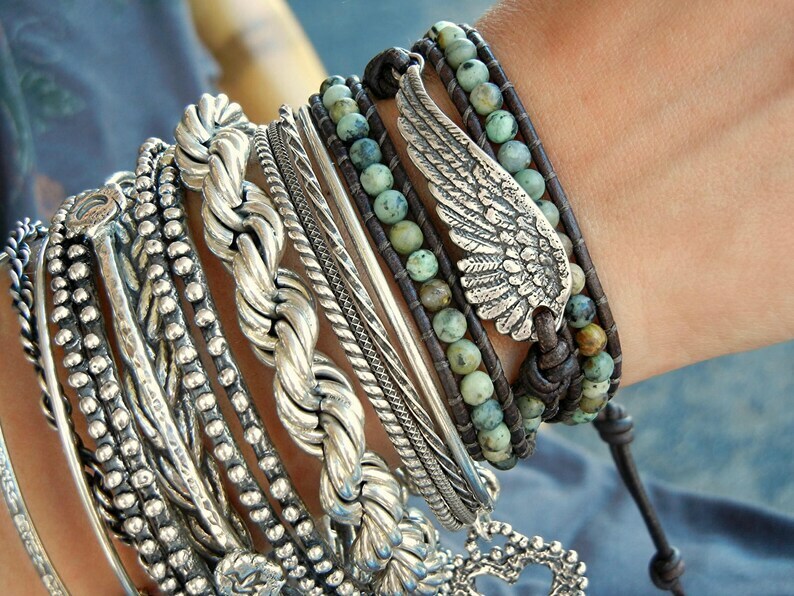 >> This listing is for ONE Angel Wing Triple Wrap Boho Bracelet. << The photos give ideas of how it will look when stacked with your own personal favorites. 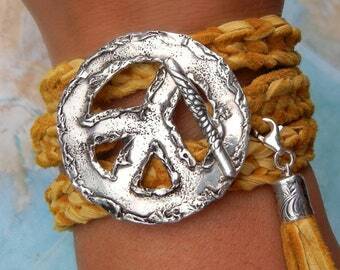 Other bracelets are shown as EXAMPLES ONLY and are NOT INCLUDED in the price, but are available by clicking below.